Display your existing S&K martin house at a fantastic height using this S&K Telescoping Aluminum Tri-Pole with Ground Socket. 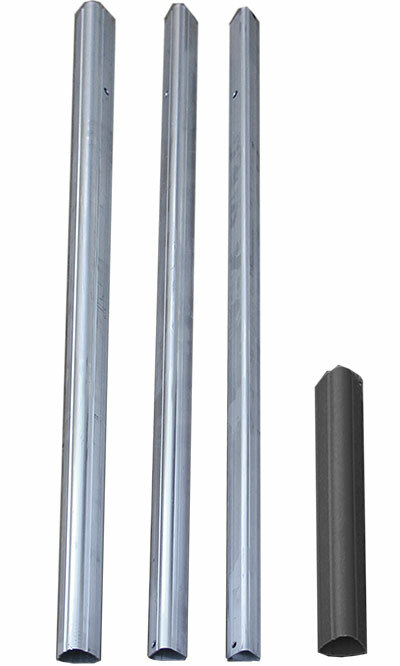 This unique, lasting pole is crafted from three pieces of durable, aircraft aluminum, which, when combined, expand to just over 15' tall, perfect for martin housing. The triangular shape of each section provides extra strength, perfectly accommodating your existing S&K martin house. Included keys keep the telescoping sections in place, and these may be loosened for you to raise and lower the pole with ease. Install the included, 16.75" long ground socket into your soil and surround it with concrete for a sturdy and lasting support, and so you can remove the pole for maintenance or mowing. The item's triangular shape is specifically designed for use with S&K martin houses or the S&K gourd rack, its aluminum construction remaining durable for many seasons. Situate your existing S&K martin house at a great height using this Telescoping Aluminum Tri-Pole with Ground Socket. Capacity: up to 20 lbs. S&K Round Pole Adapter Plus for S&K Tri / Quad Tel Pole, 41"